Last week Courtney and I took a little vacation to Montréal, Canada! After a scenic half-day of travel (we decided to go Eco-friendly and take the train), we arrived at our hostel Auberge Bishop near the Guy Concordia metro. The hostel was a lovely place to stay, and our private, warm room was just a few blocks from Beaux-Arts, downtown sights, and raw vegan restaurant Crudessence and vegan restaurant The Green Panther. It was great to map out our travel plans and warm our bones at Auberge Bishop after excursions in the city, and if you’re ever visiting Montréal, I’d recommend booking there in a heartbeat. Our sightseeing tour was a whirlwind in the best sense. We visited Beaux-Arts museum, Old City and Place-d’Armes, Jardin Botanique (the Japanese gardens were still lovely this late in the season), Basilique Notre Dame, St. Joseph’s Oratory, Mont Royal, LGBTQ-friendly cafe Le Cagibi, a farmers’ market and a cafe near Laurier metro, shopping and people/dog watching on Saint-Laurent and more. 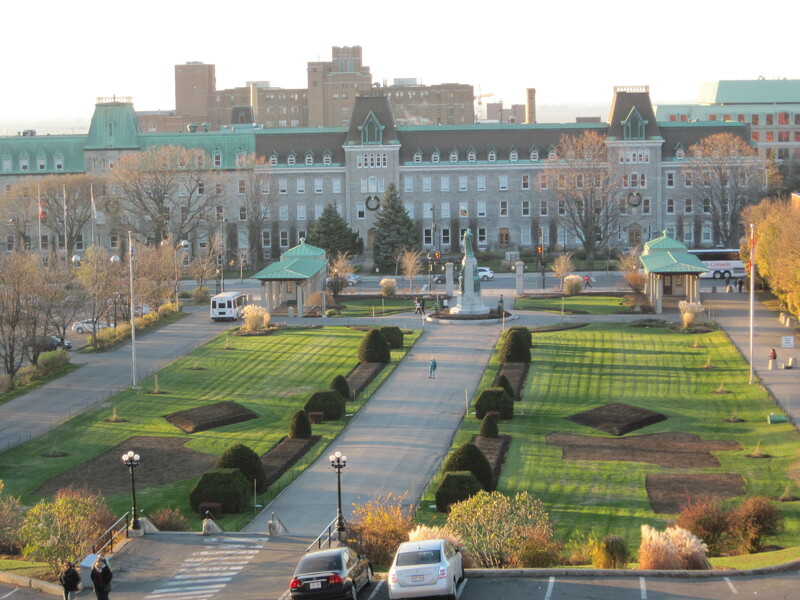 Overlooking the Bota Spa on the Saint Lawrence River in Montréal. 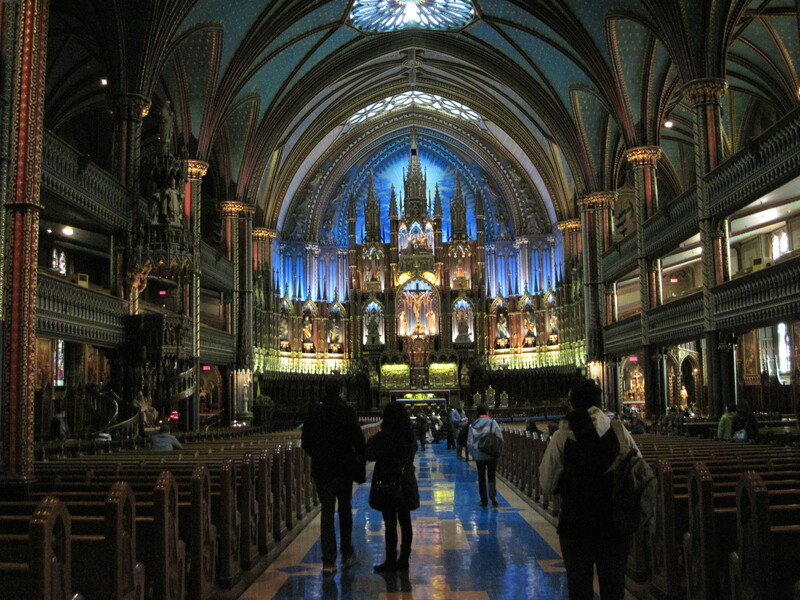 Traveling to Montréal in late fall meant much shorter lines and fewer crowds everywhere we went, which was a big boon. 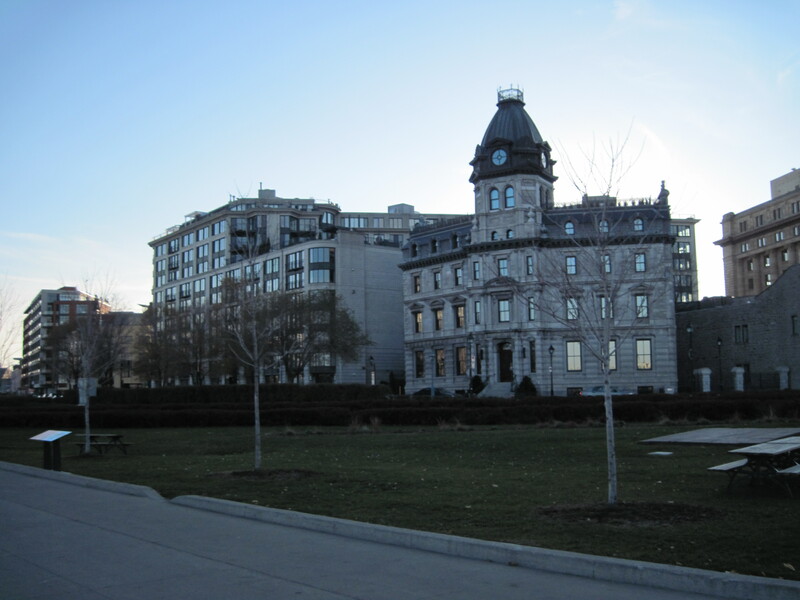 Though many attractions in Montréal get into full swing in summer, we were happy as clams bundling up and traipsing around the beautiful city in the cooler season. 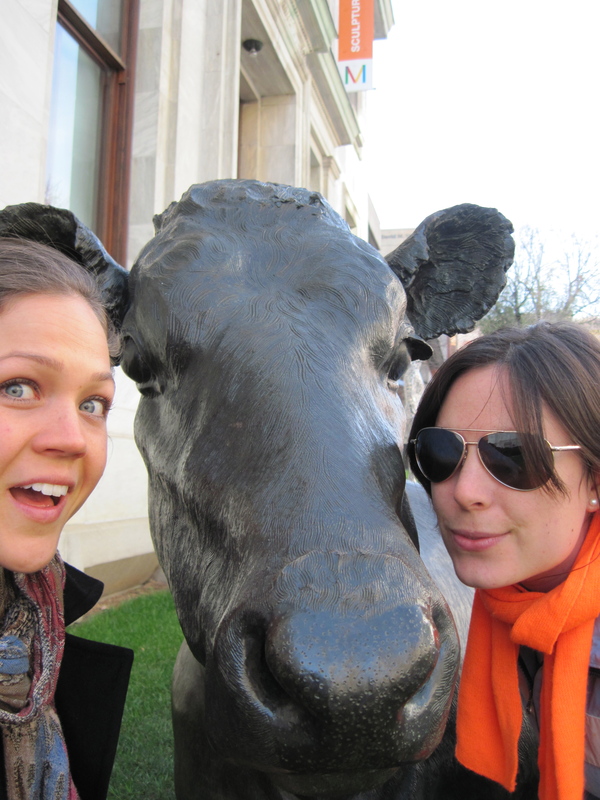 A splendid cow we met near Beaux-Arts museum. 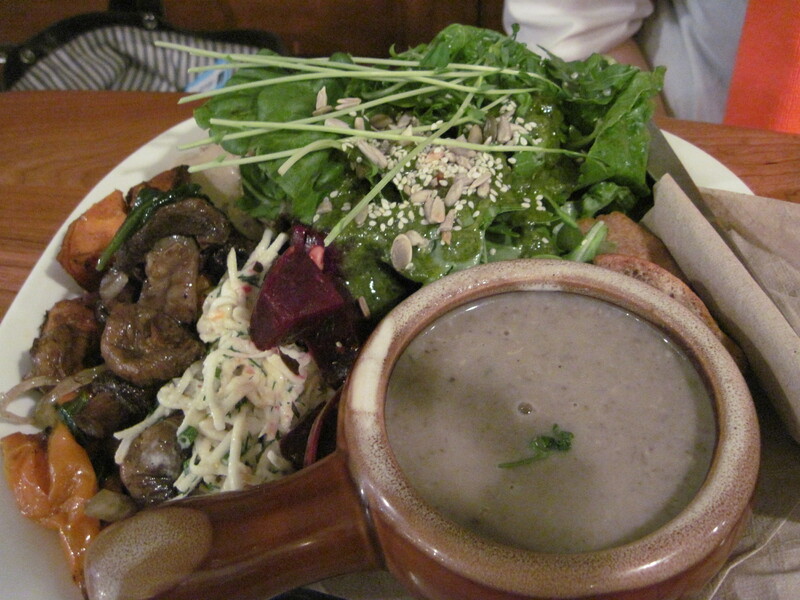 Mushroom soup and the daily salad at The Green Panther. 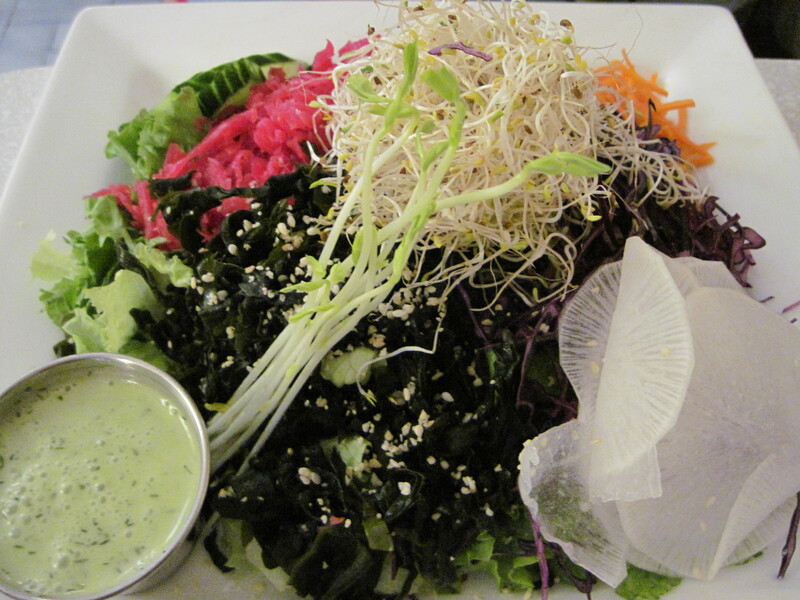 “The Living Salad” With Wakame and Sprouts at Aux Vivres. 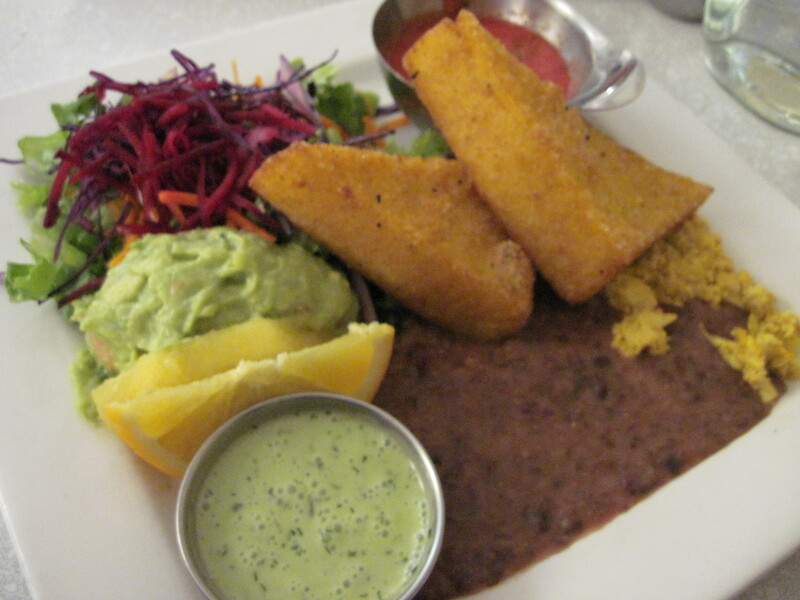 Polenta fries, beans, guacamole and salad on the brunch menu at Aux Vivres. 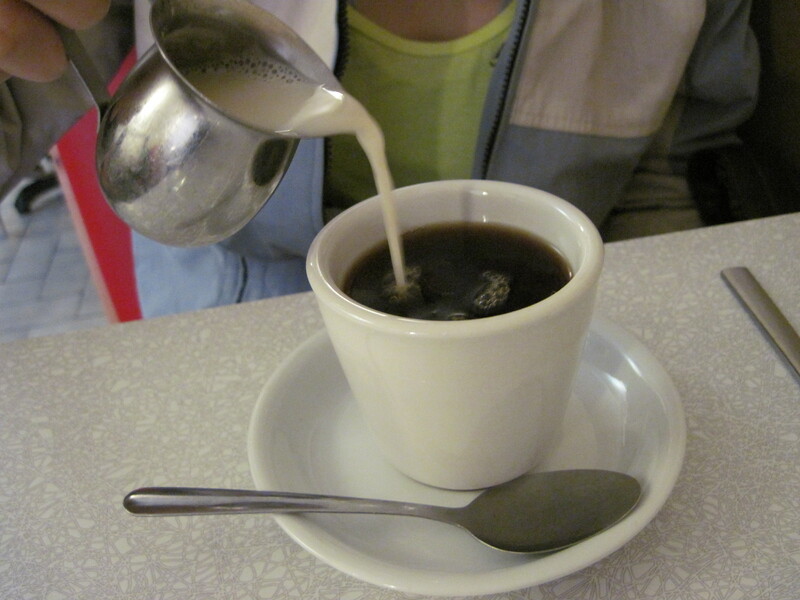 Coffee and soy milk at Aux Vivres. In addition to these wonderful vegan restaurants, we also ended our trip with dinner at O.Noir. O. Noir is a restaurant unlike any I’d been to before: The dining experience takes place in the dark! 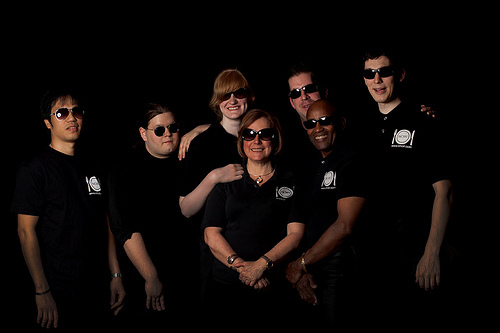 The entire waitstaff at the restaurant is legally blind, while the front of the restaurant staff and chefs are sighted. After ordering our special vegan meals in the light area and storing belongings in a locked cubby, Courtney and I made a train by putting our hands on the left shoulder of our waiter and each other and ventured into the darkness. The waiters at O.Noir are legally blind. What ensured was unlike any fine dining I have ever experienced. While we ordered all-vegan options, we had no idea what those dishes would be. When the appetizer came, we were told it was marinated mushrooms. Reader, I wish I had photos because I’m sure they were as beautiful as they tasted, but alas, no flash photography was allowed and the dish’s appearance is a mystery even to me since I enjoyed it in the pitch dark. While I mostly used my fork, I will admit I did poke around a bit with the tip of my finger to get a better sense of what I was enjoying. The main course, which the waiter informed was a polenta dish with roasted veggies, was also truly wonderful. Not being able to see the food, just listening to Courtney’s voice and the live music in the dining room, was truly a unique experience. I put a lot of trust into the staff to see that the meal was vegan, and I also longed to appreciate the look of the food. I realized that a lot of my gastronomic pleasure comes in admiring the aesthetics of the food, and that without sight I had to fully rely on just what my mouth and sniffer were telling me. After the main course, we sipped mint tea and reveled in the magic of our trip. 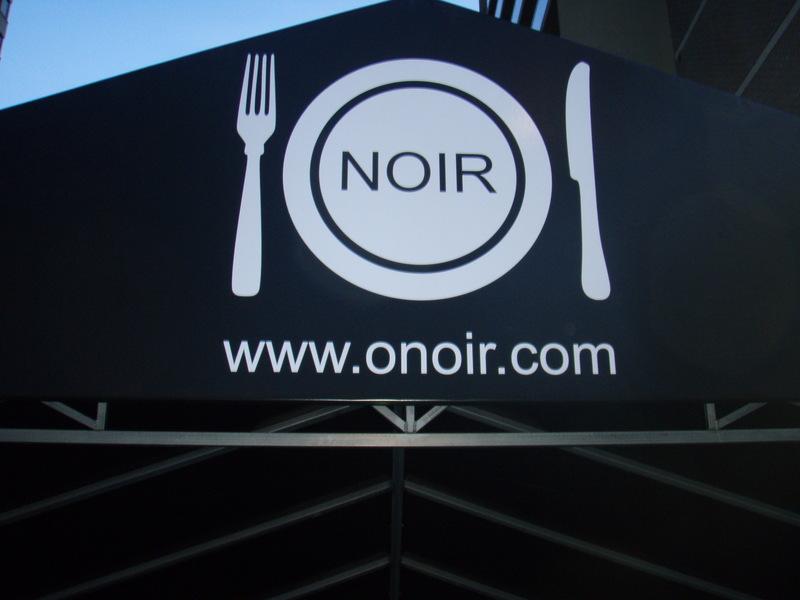 I highly recommend booking a reservation at O.Noir if you’re near one of their locations, or even blindfolding yourself and/or a friend and trying to eat your meal in the dark sometime! 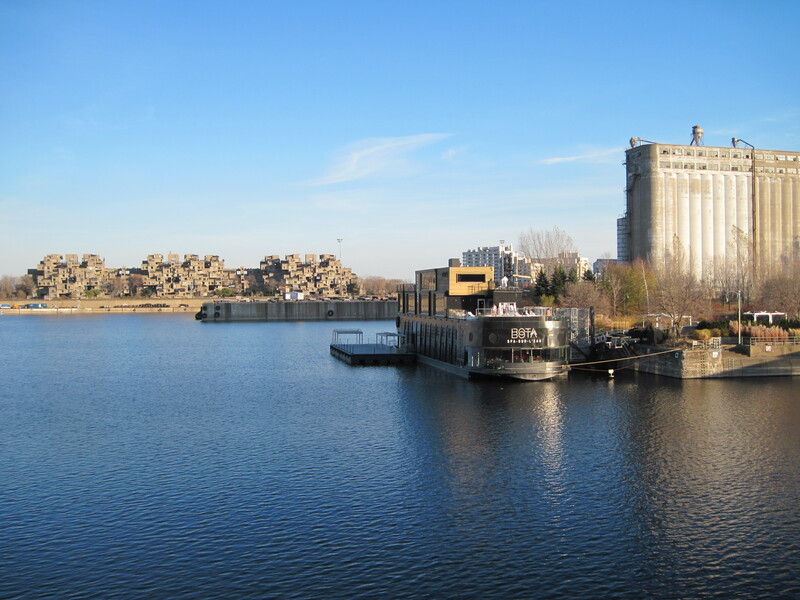 Thanks for reading about my trip to Montréal! Courtney also wrote a fantastic blog post about our trip, which you can read by clicking here. Oh, I absolutely ADORE Aux Vivres! I enjoyed that very same salad during my last Canadian adventure. Have you had the pleasure of sampling their Dragon Bowl? 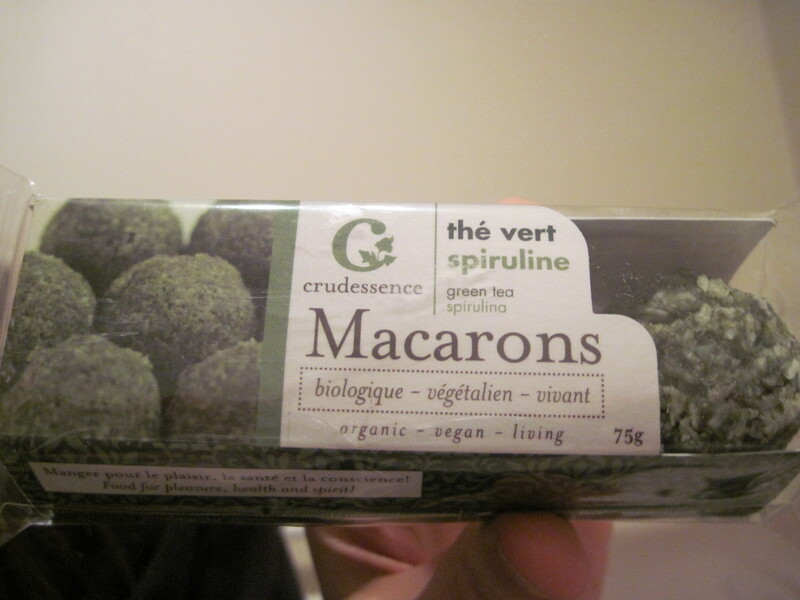 Mmm… So glad you had a great time in Montreal! What a great city. on November 24, 2012 at 5:40 pm | Reply Sarah E.
Definitely. As in turn right back around and hop on a plane immediately. Oh, and take me with you, of course. Meg, Caleb, Tillie, and I will need to go up there when next we are in Plattsburgh. 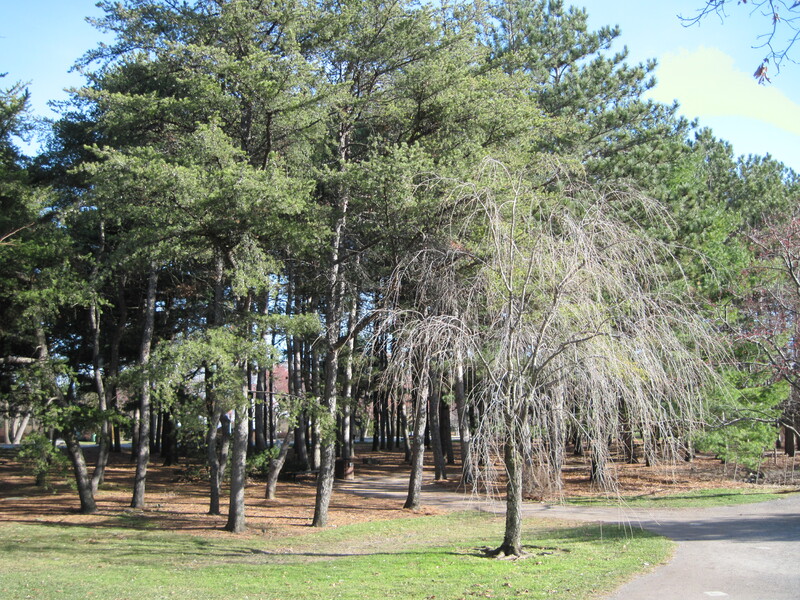 Love this post…words and pictures. 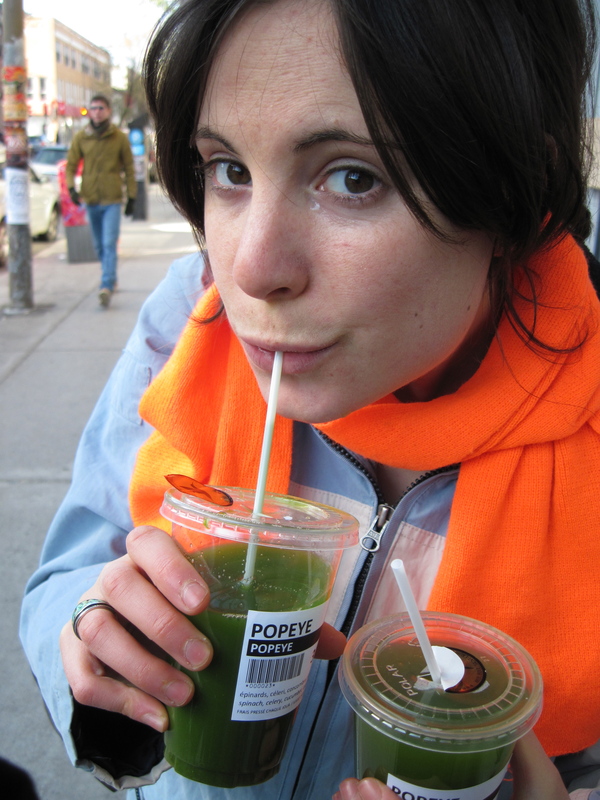 on November 24, 2012 at 8:59 pm | Reply Sarah E.
Best trip ever, baby! You’re amazing to travel with. The first of many trips!! on November 24, 2012 at 9:56 pm | Reply Sarah E.